Liberty ships were cargo ships built in the US during World War II. They were inexpensive and quick to build, and used for deliveries of war materiel to Britain and to the Soviet Union. Liberty ships were products of early prefabricated mass production, in large part an industrial response to wartime needs and a definite response to the threat of submarine attacks against merchant vessels. They were relatively simple in design and operation, reducing both construction time and time needed to train engineers. The Liberty ships and their crews of merchant seamen faced, and some falling victim to, surprise attacks from unseen enemy submarines. The first Liberty ships required about 230 days to build, but the average eventually dropped to 42 days. The record was set by SS Robert E. Peary, which was launched 4 days and 15½ hours after the keel was laid. The ships were made assembly-line style, from prefabricated sections. In 1943, three Liberty ships were completed daily. They were usually named after famous Americans, starting with the signatories of the Declaration of Independence. The keel of the USS James Swan was laid June 23, 1944 and launched in Savannah, Georgia, August 12, 1944; she was built for the US Maritime Commission by the Southeastern Ship Building Corporation. James Swan was a member of the Sons of Liberty and participated in the Boston Tea Party. Swan was twice wounded at the Battle of Bunker Hill, he later became secretary of the Massachusetts Board of War and the legislature. During the time he held that office, he helped fund the Continental Army. After the American Revolution, Swan privately assumed the entire United States French debts at a slightly higher interest rate (which he later sold.) The US no longer owed money to foreign governments, although it continued to owe money to private investors both at home and in Europe. Following the war, the USS James Swan was sold to Standard Steamship Company of Wilmington Delaware and used to deliver freight. She was renamed the Quartette. The Quartette was a three-masted single-screw triple-expansion steam engine vessel, 422-feet long, 57-feet in beam, and with a draft 35 feet deep. Her two water-tube boilers and triple expansion engine were capable of 2,500 horse power. She had three cargo holds forward and two aft. In 1952, the Quartette was chartered by the Military Sea Transportation Service and en route from Galveston Texas to Pusan, South Korea (via an interim stop at Honolulu) with a load of 9,000-tons of milo yellow grain, consigned to the US Army. Then, at 7:10 am on the morning of December 21, 1952, navigation fixes had placed the ship some nine to ten miles further away from any danger – it was wrong. The lookout had reported a line of white breakers to the chief mate shortly after 7:00 AM, but allegedly no action to avoid the approaching obstacle was taken. Then, heavy seas and 35-mph winds drove the 7,200-ton SS Quartette into the eastern reef crest of Pearl and Hermes Atoll, damaging two forward holds. The ship was firmly aground, but in no immediate danger of sinking. Attempts to back the vessel off from the reef with the engines failed. The Navy dispatched a Catalina flying boat and 170-foot patrol craft from Midway. Thirty-six crewmen were rescued on the following day, thirty-three of them being taken to Midway Island. The ship’s captain and two others (the chief engineer and radio operator) remained standing by on the patrol boat, waiting for the salvage tug. The Ono arrived on December 25th; seas were expected to increase as a storm passed to the northwest, raising concerns that salvage efforts would be postponed. In an effort to stabilize the vessel, anchors were dropped and a tow line attached. On January 3rd, the tug’s anchors parted at the shank, and the Quartette was blown broadside onto the reef. She was deemed unsalvageable, a total loss. Weeks later the ship broke her back (keel) and snapped in two, the bow portion forward of the superstructure was pushed into the shallow lagoon, and the stern and midsection (where engine was) remained in deeper water. After three successive investigations (2007, 2008 & 2010,) teams of maritime archaeologists documented the shipwreck. Debris of the ship are scattered across the reef, including an impressive propeller, steering gear, triple-expansion steam engine and 4 massive anchors. Holoikauaua (literally, Hawaiian monk seal that swims in the rough) is a large oval coral reef with several internal reefs and seven sandbar/islets above sea level along the southern half of the atoll. The land area is just under 100-acres (surrounded by more that 300,000-acres of coral reef) and is 20-miles across and 12-miles wide. The highest point above sea level is about 10-feet; the islets are periodically washed over when winter storms pass through the area. Holoikauaua (estimated age is 26.8-million years) is a true atoll, fringed with shoals, permanent emergent islands and sandy islets. These features provide vital dry land for monk seals, green turtles and a multitude of seabirds, with 16-species breeding here. Seal Island lies just inside the reef, in the southwestern section of the lagoon. It is 1,400-feet from east to west, and 300-feet wide at its broadest point, with an area of 10.6-acres. An area of the western half has almost all of the island’s vegetation. Kittery Island is a low sand and coral rubble triangle and has no vegetation. Troughs eroded in the sand of the island’s interior suggest that it is periodically inundated during severe weather. The island covers 11.9-acres; the northwestern side is highest, about 5-feet above sea level – the rest is just barely above normal high-water level. Grass Island is just inside the reef – it is 1,800-feet east to west, and only 400-feet wide at its broadest (near the western end;) it has an area of 11-acres. In 1923, Wetmore, who named this island, noted that the crest of the island was covered with grass and a few of the shrubs. Bird Island and Planetree Island are continually changing sandspits along the inner margin of the southern reef between Southeast and Grass Islands. They have been described as “merely part of a three-mile chain of shifting sandspits just inside the south reef.” A small-boat channel runs between Bird and Planetree Islands. Southeast Island, the largest of the group, lies in the eastern corner of the atoll; it is nearly cut into two unequal portions by a seaward extension of the lagoon. The entire island is 2,600-feet long east to west with a maximum width of 1,100-feet. It has a land area of 34 acres. Little North Island was officially named on February 11, 1969 – it was sometimes referred to as Humphrey Island. At low tide, it is less than 200 feet wide and is about 1,100 feet long in a north-south direction. The central portion of the main island, 400 feet long and 1.4 acres in area, is 6 to 10 feet above sea level, and has a meager flora of 4 species of grass and herbs. North Island lies in the northeastern corner of the lagoon; it has an area of 15.9-acres. The body is about 1,000-feet long north to south, and 800 feet wide; it is 10-feet above sea level. mer (sea cucumber,)” as well as green turtles, seal elephants and sea leopards. Captain John Paty of the Hawaiian schooner Manokawai stopped at the atoll in May 1857 to determine its position and map the islands. In 1859, Captain NC Brooks sailed the Hawaiian bark Gambia there and on July 5 of that year took possession in the name of Hawaiʻi. When Westerners first arrived, the atoll abounded with birds. Presently, about 160,000 birds from 22 species are seen. They include Black-footed albatrosses, Tristram’s storm petrels, and one of two recorded Hawaiian nest sites of Little terns. Since 1891, the North Pacific Phosphate and Fertilizer Company was harvesting guano from Laysan. On February 15, 1894, the agreement was expanded to cover other nearby islands and atolls, including Holoikauaua. The 25-year lease, at $1 per year, also royalties of 50 cents for each ton taken. Interest in birds expanded; beginning in 1902, Japanese feather poachers visited the Northwestern Hawaiian Islands and killed thousands of albatrosses but the extent of their poaching here is not clear. “The Hawaiian Islands Reservation was established by Executive order in 1909 to serve as a refuge and breeding-place for the millions of sea birds and waders that from time immemorial have resorted there yearly to raise their young or to rest while migrating.” It’s also part of the Papahānaumokuākea Marine National Monument. From 1926 to 1930, fishing operations became important in the history of the atoll. Pearl oysters, which yield mother-of-pearl shell, had been discovered in May 1928 by Captain William B Anderson who commanded the schooner Lanikai for the Lanikai Fishing Company; Hawaiian Tuna Packers, Ltd, partnered with them. Because of the increased interest in the fishing station and cold storage plant and in the development of the pearl oyster beds, “the Territorial Government requested the US Bureau of Fisheries to outline methods for conservation and development” of the pearl oyster bottoms of the atoll. Over the next few years they conducted surveys and studies; some fishing activity continued there from the schooner Lanikai, but by October 1931 the fishing base operated by Hawaiian Sea Products was abandoned and the Lanikai was to be laid off. The modern name of the atoll is “Pearl and Hermes.” But it’s not named because of the oyster discovery. Rather, it reflects and memorializes the twin wrecks of British whalers, the ‘Pearl’ and the ‘Hermes,’ lost 100-years before. During the night of April 26, 1822, these British whaling ships ran aground almost simultaneously. The 327-ton Pearl (with Captain E Clark) grounded into a sandy coral groove, pressing its wooden keel into the sediment, while the smaller 258-ton Hermes (with Captain J Taylor) hit the hard sea bed. The two ships had been making a passage from Honolulu to the newly discovered Japan Grounds, a track which took them through the uncharted Northwestern Hawaiian Islands. The Pearl and the Hermes (wrecked to the west of the Pearl) are the only known British South Sea whaling wreck sites in the world. The combined crews (totaling 57) made it safely to one of the small islands and were castaway for months with what meager provisions they could salvage. Using salvaged timbers and other parts of the lost ships, one of the carpenters on board the Hermes, James Robinson, supervised the building of a small 30-ton schooner named ‘Deliverance’ on the beach. Before launching the beach-built rescue vessel, the castaways were rescued by a passing ship. Though most of the crew elected to board the rescue ship, Robinson and 11 others were able to recoup some of the financial losses from the wrecks by sailing the nearly finished Deliverance back to Honolulu, and eventually sold her there. Click HERE for a link to several Google ‘Street Views’ on Holoikauaua. Holoikauaua (literally, Hawaiian monk seal that swims in the rough) is an atoll now known as Pearl and Hermes. Its modern name reflects the twin wrecks of British whalers, the ‘Pearl’ and the ‘Hermes,’ lost in 1822. Holoikauaua is a large oval coral reef with several internal reefs and seven sandbar/islets above sea level along the southern half of the atoll. The land area is just under 100-acres (surrounded by more that 300,000-acres of coral reef) and is 20-miles across and 12-miles wide. The highest point above sea level is about 10-feet. The islets are periodically washed over when winter storms pass through. Its estimated age is 26.8-million years. As American and British whalers first made passage from Hawai‘i to the seas near Japan, they encountered the low and uncharted atolls of the NWHI. There are 52 known shipwreck sites throughout the NWHI, the earliest dating back to 1822 – the Pearl and the Hermes. During the night of April 26, 1822, these British whaling ships ran aground almost simultaneously. The 327-ton Pearl (with Capt. E. Clark) grounded into a sandy coral groove, pressing its wooden keel into the sediment, while the smaller 258-ton Hermes (with Capt. J. Taylor) hit the hard sea bed. The British whaler ‘Pearl’ was originally built as an American ship in Philadelphia at least as early as 1805. At some time after that, the ship may have been captured by the French during the aftermath of the Quasi-war and renamed La Perla. She was subsequently taken by the British privateer Mayflower and from there put into service in the British South Seas whaling industry out of London. The Hermes was not cradled by the reef, but disintegrated as she pounded across the sharp reef. The Pearl, sailing close by and striking the reef only a few minutes later, was more fortunate. She seems to have lodged firmly in place in a deeper groove with her stern seaward, and then she broke up more gradually over time. Using salvaged timbers and other parts of the lost ships, one of the carpenters on board the Hermes, James Robinson, supervised the building of a small 30-ton schooner named ‘Deliverance’ on the beach. Before launching the beach-built rescue vessel, the castaways were rescued by a passing ship. Though most of the crew elected to board the rescue ship, Robinson and 11 others were able to recoup some of the financial losses from the wrecks by sailing the nearly finished Deliverance back to Honolulu, and eventually selling her there for $2,000. In 2004, NOAA divers in the Northwestern Hawaiian Islands came across the two whaling vessel wreck sites at Pearl and Hermes Atoll. The wreck of the Pearl lies seaward of the reef crest, but in the proximity of the surf zone, the Hermes site was to the west of the Pearl. Artifacts were found at the sites, however they are quite deteriorated. Large iron try pots (for rendering the whale blubber into oil,) blubber hooks, anchors, brick and iron ballast pieces and fasteners were found around each site. Cannons (four from the Hermes and two from the Pearl) and numerous cannon balls indicate the nature of hazards faced during early 19th century whaling voyages to the Pacific. 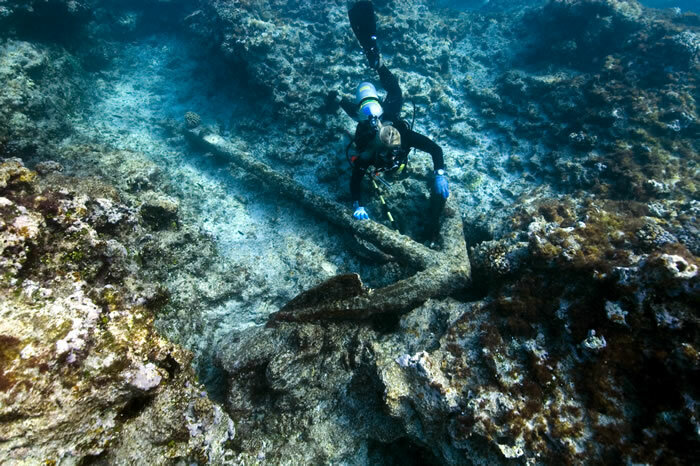 The image shows a diver investigating an anchor at the Hermes shipwreck site (NOAA-Casserley.) (Lots of good info here from NOAA.) In addition, I have included other images in a folder of like name in the Photos section on my Facebook and Google+ pages.